Our lovely holiday home has been in the family for over 40 years! It now has under-floor heating throughout, 6 comfortable bedrooms (including a separate annexe) sleeping a total of 14 people, 4 bath and shower rooms and parking for several cars. The huge windows at the front of the house all look over completely unspoilt coastline, including Pentire Glaze, the Rumps and The Mouls Island. The large patio is the perfect location for family barbeques, while the garden lends itself to games of all sorts including a huge area for football, basketball or practising golf! Well behaved pets - in the utility area - also welcome! Susie is a teacher, Phil is a builder and property renovator. We have 3 sons, all of whom spent many happy summers on 'our' beach, rock jumping, cave exploring, sand castle building, crabbing and surfing. We live in the South East near Gatwick, but go down to Epphaven whenever we can! Susie's mum originally bought the house in 1970. It always had the magnificent view, but the garden was so overgrown that you could not see out of the windows and there was no mains electricity. It is substantially different nowadays! We love the location as it is so unspoilt and yet close to all the buzz of Polzeath, Rock & Padstow. The view is simply one of the best you will find anywhere in the world! Although close to the lively hotspots of Rock and Polzeath, Tresawl is in a most peaceful and tranquil location. Perfect for all sorts of occasions whether there are 6 or 16 in your party! Large lounge/dining room with table and chairs, TV with Sky, sofa, chairs, window seat. Monopoly, Risk, Articulate etc etc. Loads of packs of cards too! Variety of body boards and wetsuits can be borrowed from our 'outdoor toy cupboard'! Roserrow Golf Course 2 miles. St. Enodoc Golf Course 4 miles. Trevose Golf Course 12 miles. Outside: Large garden with patios at front and back, barbeque, outdoor picnic table. There is also a perfect games 'pitch' to the side of the property - neighbours are far away, so you can make as much noise as you wish! Utility Room: Washing machine, dryer, extra freezer Cleaning / Towels / Linen / Maid service: Towels and linen not included. Beds are all 3' singles, as are duvets. 8 beds can be pushed together to make 4 x kingsize. Property is cleaned at changeover and arrangements can be made for extra cleaning as required. Outstanding location with wonderful scenery. House is modern and well equipt, spacious and bright. We had a wonderful stay. The extra wet suits and boards were great. The dogs loved the garden and walks. We had great weather. One of the showers leaked badly so we couldn't use it but there were others! Would recommend this lovely house. Thanks for a great holiday. Glad to hear you had a great holiday in Tresawl! Cheers, and hope you’ll come again sometime! 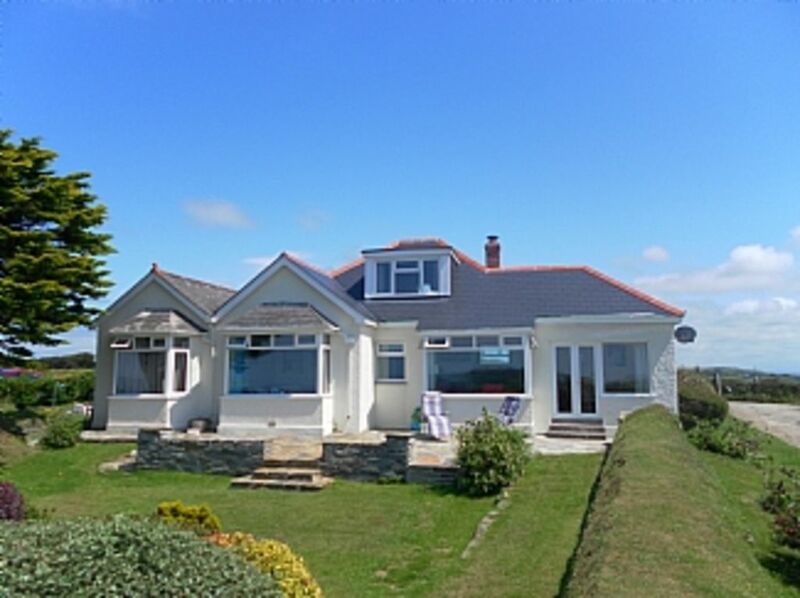 The perfect holiday house with wonderful views, short walk to the beach and lots of space outside! The property is well maintained and comfortable. There are plenty of toilets and showers and the kitchen has everything you need for a week or two. The location is outstanding, a wonderful sea view and lots of garden for the kids to run about in without disturbing any neighbours. We will definitely be back! Glad everything was so good and that you had a super holiday! Wonderful house and VIEW - everything we needed was there. Thanks Pat - glad you had such a good time! Look forward to your next visit ...! 10 of us stayed here for a hen do! It was absolutely amazing, the bad weather could have ruined our weekend anywhere else but waking up to the outstanding view and the moo moos in the next field was beautiful! The house is absolutely gorgeous and beds were so comfy! Thankyou for our stay we will be back!!! Great place for our New year break with family, weather wasn't great but still managed some fab coastal walks. bay window facing the sea was prime spot in the lounge and place was very clean and had great facilities, plenty of freezer and fridge space and drinks cooler. will definitely try and go back some day. Epphaven, 10-15 minute walk down a track, path and then rocks down to the beach. Port Quin (1 mile) has a Kayak centre, and Port Isaac (4 miles) has a pretty harbour and great pubs. Polzeath, excellent surfing, is a 5 minute drive. Daymer Bay, particularly good for younger families and those with dogs, is 10 minutes by car. Rock is also 10 minutes away, for sailing, waterskiing, banana boating and also for ferry access to Padstow. Many beaches to choose from, all within 10-15 minutes drive. 4 miles to Rock, 2 miles to Polzeath, 6 miles to Port Isaac. Historic Tintagel, the home of King Arthur, is a 20 minute drive and the Eden Project about 40 minutes. The lovely fishing port of Padstow - easily accessible by ferry over the Camel Estuary - has the famous Rick Stein restaurant and bistro, and now also boasts good shops and several small galleries. Local shops are available at Polzeath and Tredrizzick and there is a large supermarket in Wadebridge, as well as banks, chemists and all essential high street shops. Cycling along the Camel Trail between Padstow and Wadebridge is also a family favourite. Booking Notes: Book direct with the owner. 25% deposit payable on booking with balance due 8 weeks before start of holiday. Changeover Day: Monday changeover in high season, flexible at other times of the year. Arrival after 3.00pm and departure by 10.00am. Notes on prices: Please contact owner for further prices. Long weekends are available, changeover days can be altered.